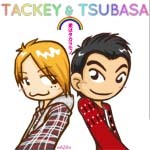 Azuki no Hikidashi is a fan art blog dedicated to Tackey & Tsubasa. In this blog you’ll find fanarts, comics, pictures, handcrafts and more of that gorgeous Johnny’s group. Of course all you’ll find is made from the heart of a fan for fans. Nothing illegal will be post on there, it’s not a place to download T&T stuff, support your artist and buy it. Feel free to share, re-post or keep any of my arts, with only 1 request, don’t made money from it. If you notice my mail, and the address of the blog, it’s “idontocry” word, this is something I borrow from Takki, from that video –link– it was one of the first videos I watched of Takki, and it’s so funny that I made it my email & blog address, that sentence remind me I am as good as Takki used to be with English language XD sorry if I made a lot of mistakes. Usually they’re bassed on true stories or facts, but it’s not my aim to create a false rumor.